What the heck is a cassoulet? I had heard the word before, but wasn’t too sure what it was before it became the Daring Cooks’ challenge for January. 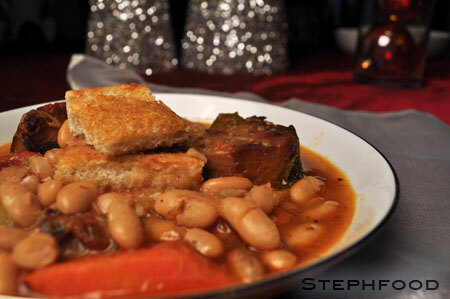 Cassoulet is a particular kind of white bean stew that originated in France. It’s become one of those dishes that ignite debates over who made it first, and what recipe is authentic. Sorry to offend, folks, but mine isn’t especially “authentic”, being vegetarian. There is usually a lot of meat involved. One of the things that you see in many cassoulet recipes is duck confit. One of the requirements of the challenge was to make some kind of confit, and again there were some veggie options. I had to look up what a confit was, exactly, since I’ve always heard it associated with duck. Basically, ‘confit’ is used to describe a few things, in particular a method of preserving food by cooking it in a fat. In the case of meats, they are usually cooked in their own fats. For things like garlic, it is cooked in oil. So what exactly does one use garlic confit for? You can use it much the same way you might use a baked garlic – the cooking process mellows out the flavours, and gives it a creamy spreadable texture. This makes it (and the oil it’s cooked and stored in) easy to use in dips, soups, sauces… just about anything. Being a big lover of garlic, I thought this would be a fun thing to try making. That done, I had to decide how to retain the spirit of a cassoulet without the meat. I opted to make the seitan sausages from last month’s challenge, and use them in the stew. I also added some smoked paprika to add some depth to the flavour. I’m pretty sure it didn’t taste like a real cassoulet, but it was really good! Modified from the recipe in Gourmet Magazine, March 2008. On a baking sheet, spread out halved tomatoes cut side up. Sprinkle with a little bit of oil and bake until soft and starting to brown on top. In a pot that can be transferred from stove to oven, heat a tablespoon of the oil with the smoked paprika. Brown the seitan sausage. Remove from heat and set aside. To the pot, add leeks, carrots, celery, garlic, oil, herb sprigs, bay leaf and 1/2 teaspoon each of salt and pepper. Stir occasionally, until softened, about 15 minutes. Stir in beans, seitan sausages, roasted tomatoes and stock. Cover, and put the pot in the oven. Cook until carrots are tender, about 30-40 minutes. Raise heat to 400 degrees, and put back into the oven for about 20 minutes. Arrange bread slices on baking sheet, and brush with a little bit of the garlic oil. Put in the oven for about 5-10 minutes – just enough to toast the bread. Slice into squares (will be used to top the stew). If necessary, spoon excess oil from the top of the cassoulet. Mash some of beans in pot with a potato masher or back of a spoon to thicken broth. Serve, with some pieces of the toasted bread in the bowl. Place garlic in a single layer in a sauce pan. The pan shouldn’t be much bigger than the layer of garlic – too big of a pot/pan will require more olive oil in order to cover the garlic. Completely cover the garlic with olive oil. Add the peppercorns and bay leaf. Start by heating the pan on medium heat. Once bubbles start to appear, turn the heat to low and keep at a very low simmer. You don’t want to boil the oil. Cook for 30-40 minutes, until the garlic cloves are soft. Take off the heat and allow everything to cool before putting into an airtight container. As long as the garlic is covered in the oil, it can keep for about 2 weeks. Your veggie cassoulet is gorgeous! Caught my eye in the forums when I saw it topped with that lovely crouton 🙂 Love that you made seitan sausage for your cassoulet, and your garlic confit looks amazing. I have to try that myself. Beautifully done all around, and thanks for taking part in our challenge! 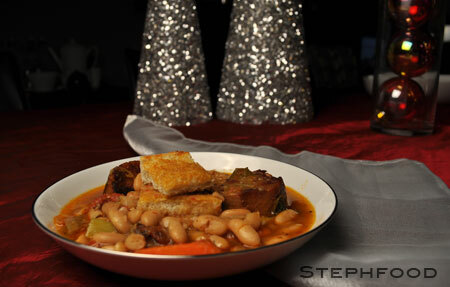 Your veggie cassoulet sounds and looks wonderful I love the crisp bread pieces on top. And you made seitan sausage well done. 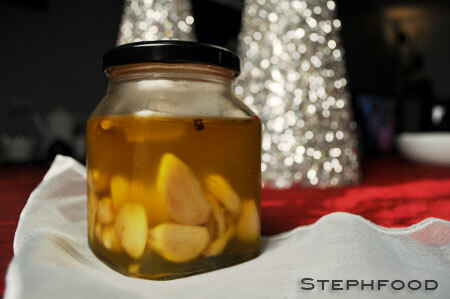 The garlic confit looks perfect marvellous effort and stunning result. Didn’t taste like ‘a real cassoulet’? Who would know? There are so many versions out there no-one could every point to the ‘real’ one. We went with Anthony’s version and loved it, but we can’t see any obvious reason why we wouldn’t love yours too. Well done on a great result and interpretation! Double well done on using a previous challenge! Well it certainly LOOKS and SOUNDS like a “real” cassoulet! Awesome job doing the seitan, too, to go with this. Really great job on the challenge. Can I come over next time you make this? It looks and sounds amazing! I still want to try the seitan sausages from the poaching challenge, and I bet they were a great addition to the cassoulet. Beautiful job, and thank you so much for sharing!! Though I am very much a meat eater that garlic confit looks wonderful. I am definitely going to try that. I agree with David and Stacy no two cassoulets are the same, it is always different every time I make it. Thanks for the interesting post. Seitan sausage sounds fascinating and I love that you added paprika to your cassoulet. It sounds great to me! This looks fabulous, and it’s the only one I’ve seen using seitan sausage. I like the idea of the paprika for flavour–in fact, I could go for a helping of this right now! Love your garlic confit, and your vegetarian “cassoulet.” I make a version of a vegetarian cassoulet simmilar to this one, and I know that it’s absolutely delicious. By the way, why don’t you stop by my blog. There is a nice prize waiting for you. Come on over and pick it up. It looks delish – I like the paprika in there….for depth of flavour and the photos are gorgeous.